SHORT TRACK RACING: HOMAGE TO A FORGOTTEN SERIES! Hard to believe it’s been nearly 20 years since the Championship Auto Racing Series (CARS) ran exciting, wheel to wheel stock car races on short tracks around Indiana. 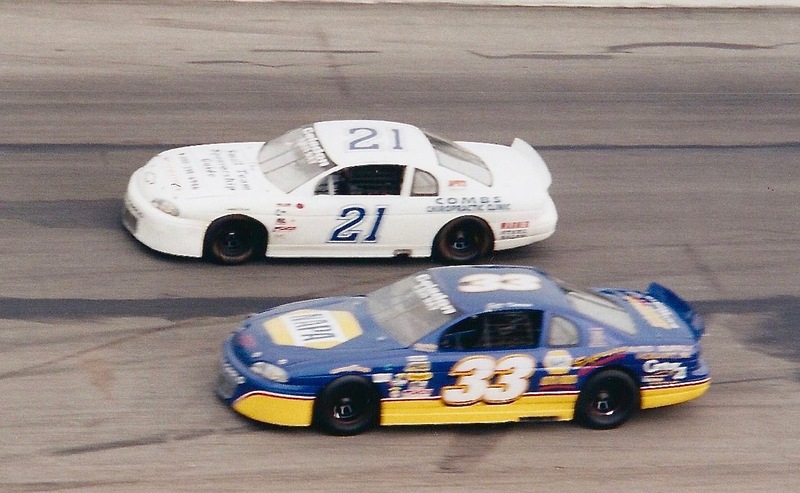 This series was distinct from and should not be confused with today’s southeastern CARS series that descended from the old Hooters ProCup series, blogs Stephen Cox. The original CARS series was Indiana-based, founded by former ARCA driver Morris Coffman. The concept was built around a spec stock car chassis powered by 305 cubic inch Chevrolet small block engines with two-barrel carburetors that produced about 335 horsepower. The hard compound tires were grooved to limit grip. A completed ready to race car was available for about $20,000, while kits could be purchased for half that price and assembled by the race teams. The result was a fun, affordable mid-level touring series that frequented premier Midwestern short tracks including Indianapolis Raceway Park (now Lucas Oil Raceway), Winchester Speedway and Ileana Speedway. The crowds were good. The racecars were fun to drive. They had enough power to slide through the turns but not so much grip that engine prices soared into the stratosphere. For a while – a very short while – CARS provided an excellent platform to learn the craft of stock car racing. I competed in the series from early 1999 until August 2000. 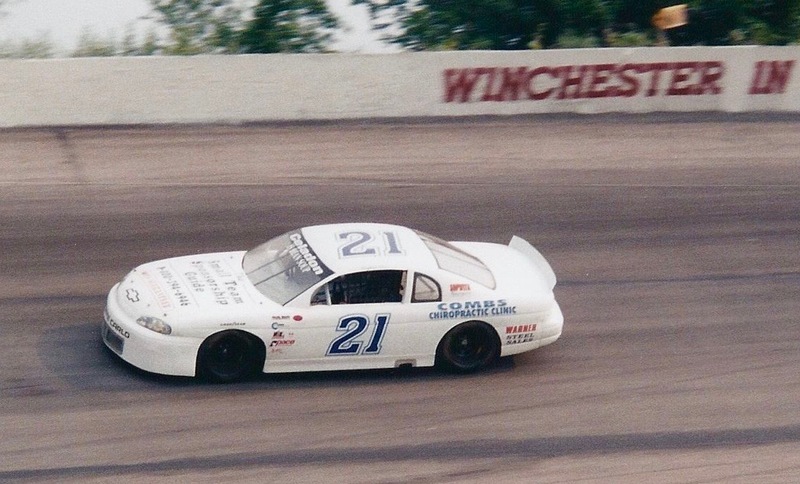 My record was marginal, winning two of the series’ smaller events, sitting on the pole at Winchester and finishing sixth in the season points championship. But the competition sharpened my driving skills and introduced me to some great people who remain friends nearly two decades later. On September 19, 1999, a bright and cool Sunday afternoon, we put on a pretty good show for Winchester Speedway’s race fans. The top five cars broke away from the field and ran nose-to-tail and sometimes side-by-side on Winchester’s extreme, 32-degree banking for most of the 20-lap feature. My father and spotter, Nelson, coached me up to fourth place late in the event. The whirlwind speeds of Winchester’s high groove took your breath away, especially when running in a two or three-wide pack of five cars, all-vying for a win before a huge crowd at a historic track. I finished fourth in one of the best short track races of the year. Series front-runners included many outstanding drivers who had already proven themselves winners at other levels of racing. Mark Fesmire could do no wrong in the 1999 season and left us all in the dust on his way to the first CARS championship title. 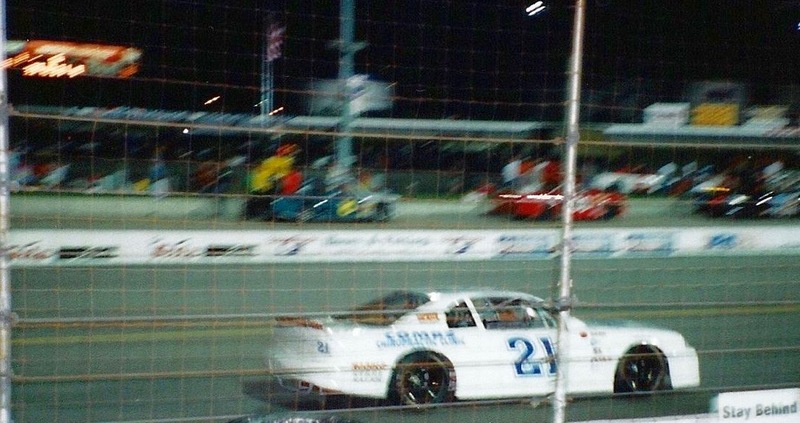 Indiana short track legend Eddie Van Meter won in front of 25,000 fans at Indianapolis in May 2000. Jeff Cannon was so fast he couldn’t keep tires under his car. Bob Dumke, Tim Green, Wes Bullock, Tim Wallen and other fine drivers competed in my era with many more joining after I departed for the Hooters Pro Cup Series in late 2000. Going through multiple ownership changes, the series was active as late as 2012 although it struggled to draw entries. It eventually faded away, forgotten by all but a handful of former competitors. The Championship Auto Racing Series existed in the era immediately preceding the Internet, so not a trace of its history can be found online. It existed in the earliest era of digital photography, so traditional 35mm photos are scarce and the few available digital pictures are of poor quality. As far as I can tell all records of its races and indeed, the very existence of the series, have been lost. Stephen Cox: Driver, FIA EGT Championship & Super Cup Stock Car Series, CEO, Sopwith Motorsports Television Productions Co-host, Mecum Auctions on NBCSN. The post SHORT TRACK RACING: HOMAGE TO A FORGOTTEN SERIES! appeared first on Car Guy Chronicles. ZAGATO CENTENARY: ASTON MARTIN DB4 GT & DBS GT! DBZ Centenary Collection showcases DB4 GT Zagato Continuation and DBS GT Zagato, with production limited to 19 pairs. None sold separately. In 2019, legendary Italian design house Zagato celebrates its centenary. For 58 of those hundred years, Aston Martin and Zagato have enjoyed a remarkable creative partnership. One in which these two iconic brands have created some of the world’s most desirable and stimulating cars, from the first DB4 GT Zagato to the latest Vanquish Zagato Shooting Brake. To commemorate this landmark year, Aston Martin and Zagato are continuing their historic partnership with a truly unique collaboration: The remarkable DBZ Centenary Collection pays tribute to an icon of the past and creates a future classic. With a build run strictly limited to just 19 pairs, this exceptional duo comprises a new, track-only DB4 GT Zagato Continuation and a new, road-legal DBS GT Zagato. The DB4 GT Zagato will be built at Aston Martin Works, Newport Pagnell – the original home of the DB4 – while the new DBS GT Zagato will be produced at Gaydon, Aston Martin’s global headquarters. Perfectly bookending Aston Martin and Zagato’s shared history, the DBZ Centenary Collection will be sure to take their place among the most coveted cars in the world. Built to race against the might of Ferrari in the 1960s, the DB4 GT Zagato was a thoroughbred machine. Evolved for the rigors of motor racing and blessed with breath taking beauty, just 19 were built. Drawing on Aston Martin Works’ unrivalled knowledge and expertise, DB4 GT Zagato Continuations will be completely authentic and meticulously crafted cars that are true to original Zagato-bodied DB4 GTs produced by Aston Martin and Zagato in 1960. Originally built as an evolution of the short-chassis DB4 GT, the DB4 GT Zagato Continuation follows the same recipe, with thin-gauge aluminum body panels, dressing a lightweight tubular frame. To improve the accuracy and consistency of the panels, the continuation car’s bodywork uses state-of-the-art digital scanning technology, before being hand-finished. Beneath the bonnet sits a version of the celebrated Tadek Marek-designed straight-six cylinder engine with two spark plugs per cylinder, transmitting 380 horsepower to the rear wheels through a four-speed manual transmission and limited-slip differential, for an authentic and unforgettable driving experience. The second half of the DBZ Centenary Collection is the DBS GT Zagato, which takes Aston Martin’s most potent series production car – the brand new DBS Superleggera – as the starting point for Aston Martin and Zagato’s latest and most exclusive offering. Created to embody the next evolution in Aston Martin Zagato design language, the exterior of the car will be characterized by a new proportion featuring a fresh interpretation of the iconic double-bubble roof. Together with a striking front grille treatment and a dramatically truncated tail the DBS GT Zagato will present an amplified physique and an unmistakable presence that combines classic Zagato hallmarks with spectacular new signatures. Paired to the build run of 19 DB4 GT Zagato Continuations, the DBS GT Zagato will also be the rarest of all the modern-era Aston Martin Zagatos. The DBZ Century Collection will be priced at £6m (approximately $7.9m USD) plus taxes. First deliveries to customers will commence QTR 4 2019 for the DB4 GT Zagato Continuation and QTR 4 2020 for the DBS GT Zagato. The post ZAGATO CENTENARY: ASTON MARTIN DB4 GT & DBS GT! appeared first on Car Guy Chronicles. MONTEREY CAR WEEK 2018: THE QUAIL! The Quail, A Motorsports Gathering is not your average 16-year-old. Yes, the swagger is there but it’s less arrogant, more confident. And if she exhibits any aggressive behavior it’s in the way she is determined to please all within her intoxicating embrace, blogs photojournalist Jim Palam. So how did I get so lucky to gather here in the manicured splendor of the Quail Lodge & Golf Course in Carmel, floating among the magnificent motorcars, bounteous buffets and beautiful people? Ah yes, I am here to shoot the pictures and tell the stories of the event, now in its 16th year, that many consider the Crown Jewel of all Monterey Car Week events. So grab a glass of champagne and come-along with me for Part II of my three-part Monterey Car Week report – a peek into the pomp, polish and pleasure that is The Quail. The Rolex Circle of Champions – Best of Show 1953 Lancia Aurelia PF200C, above, was the first car I photographed, not because I’m a predictor of outcomes, but because it truly has magnetic appeal – and it was parked close to the entry point of the show! You know you’re about to experience something special when it’s not even 8 AM and they’re handing out champagne under the towering entrance gate to The Gathering. A feature of the show-winning Lancia that first caught my eye was the chrome bumpers where rear lights would normally be. With seating and controls far forward one appears to be piloting the Lancia rather than driving it. “Everything Else Just Became Transportation.” The folks behind the Genesis Essentia Concept Car know how to write a good tagline – and how to dazzle the Quail crowd with a big-screen video backdrop that looped stunning high-definition black & white graphics and cityscapes behind their sleek and sinister showstopper. What can I say that hasn’t already been said about this icy-blue Bugatti Type 57 Atlantic Coupe – other than it’s more Pacific on display at The Quail – and a galactic gem wherever it dazzles! Porsche hopes to flip the Sizzle-Switch again in 2020 with it’s all-electric Mission E Taycan, which sat book-ended with ‘48 Porsche No. 1 Type 356 on the heavenly white 70 Years of Porsche stage. Jose Fernandez of Mexico City had a dream – to build a traditional, handcrafted, coach-built ‘Speciale’ as an homage to the Michelloti-designed, Vignale-bodied racing Ferraris of the early-1950s. With deep pockets, determination and the skills of The Creative Workshop, his Custom Coachworks 1966 Ferrari 330 GT Speciale was unveiled at The Quail. Simply WOW! The heart of Mr. Fernandez’s dream car – a matching numbers, modified Ferrari 330 Columbo 60-degree V12, 3,967cc, SOHC, 24 valve motor. It’s a treat for the ears and eyes. Ever been too early for something – like the unveiling of the custom-built Hennessey 7.6 Liter Twin-Turbo V8 engine capable of achieving more than 1,600 horsepower at 7,200 rpm? Me neither, until The Quail. I did get to photograph the awesome Supercar she’ll be powering though. I’m good with that. You’re looking at Zora’s #58053, the first L88 Corvette prototype development car and Ken Kayser, the insider, one of its owners, and author who has written the definitive story (http://www.tachometerpublishing.com/order/zoras-58053) of this legendary build. It’s believed to be the first St. Louis assembled Corvette with the big-block Mark IV 427 RPO-L72 engine. This impressive lineup of legendary Lancias sat ready to rally in front of the winner’s ramp at The Quail. The successful Martini Racing sponsorship with the works Lancia team lasted for over a decade, starting in 1982. Chasing Classic Car’s Wayne Carini describes the size a wad of car restoration cash needs to be to bring a classic to The Quail in show-winning condition! The gent representing the Jim Glickenhaus SCG 003S Supercar was somewhat tight-lipped about details. There’s nothing sleepy about this Sleepy Hollow, NY- based, 800-Horsepower, 2,700-pound Stradale. This ‘78 Dome ‘Zero’ was one of the road-going Supercars developed in Japan by racing aficionado Minoru Hayashi. Dome prototypes were intended to offer an alternative to exotic European Supercars. When Curtiss Motorcycles CEO Matt Chambers unveiled the unpainted, all electric Zeus motorcycle at The Quail Motorcycle Gathering back in May he was wearing a suit, albeit without a tie. Just three months later he has added color and performance enhancements to the Zeus and ditched the suit. I like your style, Matt! Even though there were only 435 Kaiser Darrins produced, many of you car guys are familiar with its quirky exterior design and sliding channel doors. So I thought you might enjoy this look at this ’54 K-D’s soothing Seafoam interior. Designed by Howard “Dutch” Darrin, power came from 161-inch Six. The Senna is the most track-focused McLaren ever built, delivering a power-to-weight ratio of 668 PS-per-tonne (659 bhp). Impressive – but not to the two ‘Twenty-Somethings’ standing next to it at The Quail. “Yeah, it’s fast but this one is just boring looking.” Apparently, the monotone color scheme left them wanting! How to standout in a field of Porsches: Go small. This stunning ½-scale, gas-powered 356 ‘Speedster’ is a highly-detailed, fully-functional driver! Croatian EV manufacturer Rimac Automobili brought its beautiful blue California Edition C–Two to The Quail. With a sticker price of over $2 million this hyper-EV delivers 1,888 horsepower, goes from 0 to 60 in 1.85 seconds and has an advertised top speed of 258 mph! Well guys, I was hoping to finish this report with a cool shot of this wicked ’65 GT350 Mustang. But darn it, this visitor from Belarus walked into the picture. I’m sorry. Stay tuned for the final installment of my Monterey Car Week coverage – coming soon! The post MONTEREY CAR WEEK 2018: THE QUAIL! appeared first on Car Guy Chronicles. OPEN ROADS, PART 1: COLORADO TO CALIFORNIA ON US ROUTE 50! The Loneliest Road isn’t quite as lonely as it once was, but it should still be on the bucket list of every automobile enthusiast, blogs racer, TV personality, Stephen Cox. I drove more than 1,200 miles this summer on America’s “Loneliest Road,” US Route 50 West, as part of https://www.rallynorthamerica.com/ The event itself was remarkable, featuring incredible scenery, a family-like atmosphere with friendly people and a week of immersion in the automotive lifestyle. The rally started in Pueblo, Colorado and traveled west through Grand Junction to Salina, Utah, then continued across the Great Basin desert on Route 50 to Reno, Nevada. Now hear this. When one thinks of North American deserts, they are generally regarded as inferior and/or somewhat less threatening than legendary whoppers like the African Sahara. Having now crossed Death Valley, the American Mojave, Sonora and Great Basin deserts as well as spending a full month in the Sahara a few years back, I can say from personal experience that the desert you will cross on US Route 50 West is on par with any in the world. It is just as dry and hot. Just as beautiful and deadly. And, in many places almost as remote. If your radiator lets go along the 120-mile stretch between Mt. Callaghan and Fallon Station in Nevada, you’re going to have a rough day. It’s like a scene from an apocalypse movie without the popcorn! On the bright side, Route 50 is a speed demon’s paradise. There’s not much traffic, which makes issuing citations a less profitable enterprise. And “confiscating” the cars of independent-minded motorists is challenging when the nearest tow truck is 100 miles away. I honestly don’t remember what the speed limit was because in over 1,000 miles of driving I never saw anyone abiding by it. The scenery is some of the most striking in all of North America. The route winds up into desert mountains, then back down into the dry valley below. You drive a hundred miles through the most desolate country imaginable and then repeat the process. You pass no one. The desert valleys are pancake flat and you can see 20-30 miles distant. Not a soul in sight. It’s just you and the rhythmic purr of your engine. At any speed you care to drive. The towns are small and few. But occasionally you run across a real gem, like the Hot Spot drive-in restaurant in Salina, Utah or The Cup coffee shop in downtown Ely, Nevada. There are also many historic sites along this route, but two really stood out. The ruins of the Cold Springs Pony Express Station, below, were stunning. It was like going back in time. I’d tell you how to get there, but it’s not near anything. In twenty years of travel across fourteen countries, this is one of the most remote historic sites I’ve ever seen. Perhaps that’s why the stone ruins are still in near perfect condition after more than 150 years. Start in Reno, drive 90 miles west on Route 50 and look for a historic marker. It’s worth the trip. Bring drinking water, a hat and hiking shoes. You’ll walk nearly two miles into the desert to see this site, but you’ll be glad you did. The second must-see site is the Museum of the Mountain West in Montrose, Colorado. Tens of thousands of old west artifacts are housed in historic buildings that were saved from the ravages of time and moved to Montrose where they now form a miniature western town from the late-1800s. The founder and his wife will greet you in the parking lot. Their passion for all things old west is contagious. The museum is only a few minutes detour from Route 50 and very rewarding. Save up your pennies and prepare your favorite sports car. The thousand-mile trek across US Route 50 West is a bucket list experience for any motoring enthusiast. The post OPEN ROADS, PART 1: COLORADO TO CALIFORNIA ON US ROUTE 50! appeared first on Car Guy Chronicles.